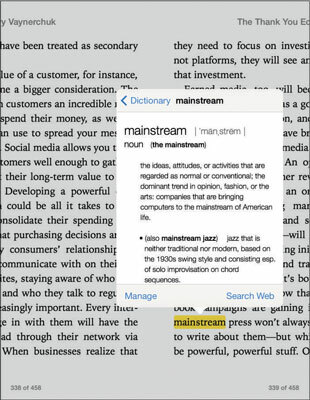 If you like to know what every word means, you’ll appreciate the iPad’s built-in dictionary. As you read a book, if you come across unfamiliar words, don’t skip over them — take the opportunity to learn a word! The built-in dictionary in iBooks even recognizes many proper names, such as historical figures and geographic locations. With a book open, press your finger on a word and hold it until the toolbar shown in the figure. Check a selected word in the built-in dictionary. A definition dialog appears, as shown in this figure. Tap the definition and scroll down to view more. When you finish reviewing the definition, tap anywhere on the page. You can also tap the Search Web button to look for information about a word from web sources and tap the Manage button to choose which dictionary your definitions come from.